A question that has been turning up in my mind regarding the Hit The North expedition is: Where exactly is ‘The North’ and how will I know it when I arrive there? As a southerner my response to this question has always been somewhat fuzzy and I’ve usually settled on the city of Nottingham as representing some kind of North/South border town. Seeing as I’m presently not that far from Nottingham in my expedition to The North, I decided to ask the collective hive mind of Twitter and let them sort out the question once and for all. Responses rolled in immediately and a consensus was quickly reached that Nottingham is a Midlands city. Here are some of those responses. …which affirmed my suspicion of Nottingham as a frontier town. Where does The North start? Two votes for Chesterfield, should that be my target town? We then started discussing rivers. So there we go. The hive mind has spoken and said its piece. I’m settling on a Trent/Humber border with Chesterfield as my target town for the ‘Hit The North’ expedition. Hi Bob, yes, J told me about the family Chesterfield connection, all the more reason to make it the target for my Hit the North expedition! 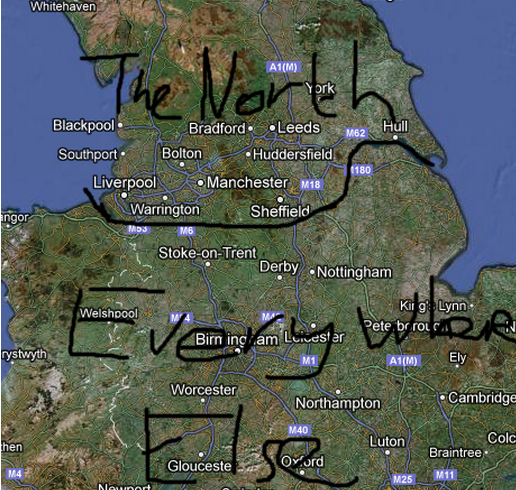 Interesting debate on where the North starts. The north-south divide as defined by Professor Dorling is quite controversial but rings true for me: http://eastofelveden.wordpress.com/2012/03/28/north-south-divide. I was born and brought up slightly south of where I live now, yet this was ‘North’ by Dorling’s definition and now I live ‘South’. Intuitively, this actually feels about right even if is incorrect in terms of latitude. Hi Laurence, thanks for dropping by. Your north-south divide post is fascinating, I’ll have to look into all this further. Cheers! Stumbled across this site via your Youtube channel. I’m building up the courage (and equipment) to go and camp in the woods locally. I’m a Lincolnshire guy and my southern friends think I’m a northerner but I always think of myself as an Easterner. Just to confuse matters further! An area of Lincs worth a look (or at least a Google map gander) in terms of low population count is a triangle between Grantham, Stamford and Bourne. Lovely rolling countryside there too. Any further east and you hit the fens. Ingoldsby Woods is a big old forest I have my eye on. That’s where I’m hoping to stay. Strange circular iron age thing too at the north end, viewable on Google Maps satellite view. Just need a sleeping bag and a cooking system. I fancy a gas wood stove. I heard a cuckoo there whilst walking recently. Be lovely to sleep there. Hi Dan, thanks for dropping by. I’m really looking forward to exploring Lincolnshire, it’s a big county and one often overlooked by walkers/hikers. Ingoldsby Woods looks great on Google Maps, one for the future. Are you planning on a tent, hammock or tarp and bivvy? I’d love to hear how you get on, do you have a blog?